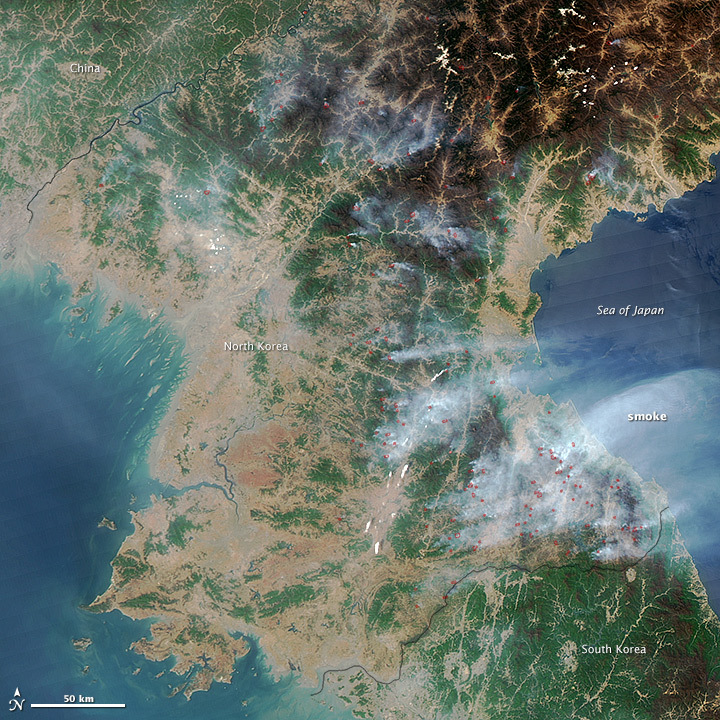 On April 25, 2014, the Moderate Resolution Imaging Spectroradiometer (MODIS) on NASA’s Aqua satellite observed dozens of fires burning in North Korea. Actively burning areas, detected by the thermal bands on MODIS, are outlined in red. 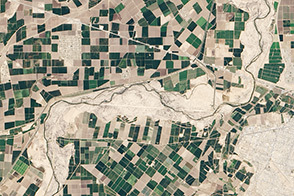 Fields and grasslands appear light brown. Forests at lower elevations appear green; at higher elevations, forests are still brown at this time of year. Many fires appear in farming areas along rivers. 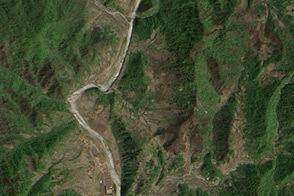 While North Korea’s best agricultural land is located on the coastal plain in the western part of the country, many people farm marginal land along rivers in the mountainous areas. They use fire to clear debris from last year’s crops and to help fertilize the soil for the coming season. However, some of the fires were burning in heavily forested areas, suggesting that they might be wildfires. 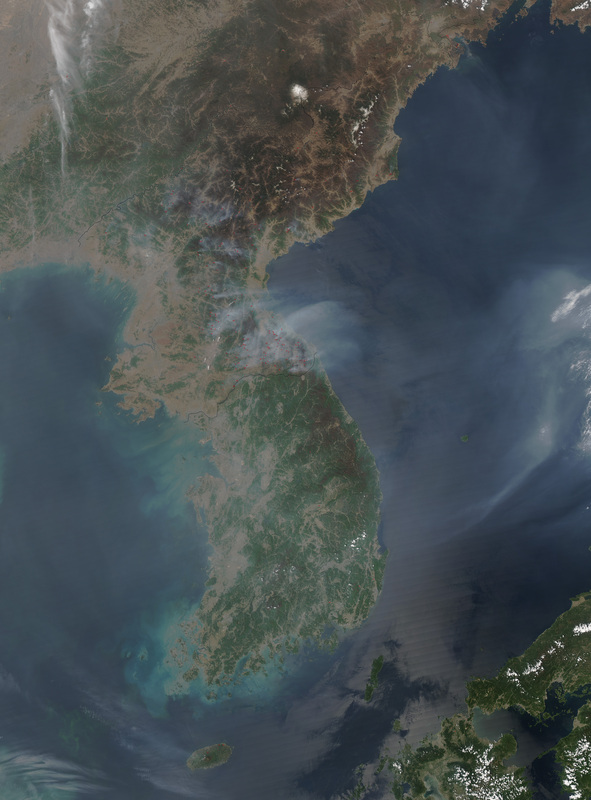 Drooping wires on aging power lines are a common cause of wildfires in North Korea, according to a report published in the Asia-Pacific Journal. 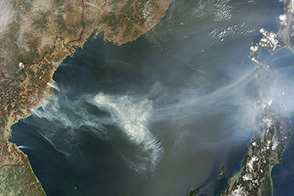 Collectively, the fires produced enough smoke to send plumes of haze drifting east over the Sea of Japan. 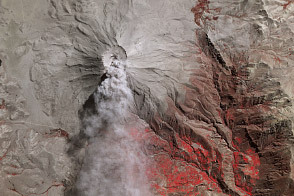 In April 2014, the Aqua satellite observed dozens of fires burning in mountainous parts of the country. 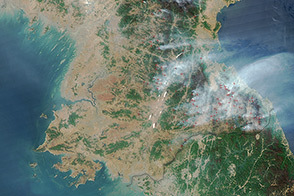 Dozens of fires burned in mountainous parts of North Korea in April 2014. 38 North (2013, December 18) The State of North Korean Farming: New Information from the UN Crop Assessment Report. Accessed May 1, 2014. Global Forest Watch North Korea. Accessed May 1, 2014. Kim, D. et al Forest Cover Change in the Korean Peninsular Assessed Using Global Land Survey data. Accessed May 1, 2014. Hayes, P. (2009, October 12) Unbearable Legacies: The Politics of Environmental Degradation in North Korea. Asia-Pacific Journal, (41), 2-09. NKNews (2013, January 11) How We Survived On The North Korean Farm. Accessed May 1, 2014. Slate (2012, March 1) Why is North Korea Always Short on Food? Accessed May 1, 2014.